While on one of my frequent excursions through the used cd bins at Cheapos (a local used music store) I came across a rapper’s name that instantly brought one song to mind. The rapper was Kid Frost and the song was “La Raza”. As a kid I loved that song, and since the cd was only a couple bucks even if the rest of the album sucked it wouldn’t be that risky of an investment. For those of you who don’t know, Arturo Molina Jr., better known to the world as Kid Frost is a latino rapper from the left coast out of East Los Angeles that came on the scene in the early nineties. “La Raza” which was the first and only single released off Frost’s debut album Hispanic Causing Panic created a little buzz for the rapper upon its release. After checking Wikipedia, I found it surprising that the man went on to release 10 more albums, with the most recent one coming in 2007. Really? I thought he was dead, locked up, or just plain fell into the hip-hop black hole that’s consumed many a rapper in our chosen genre. This is my first time listen to this album, so with no further delay let’s take care of business. La Raza – This is the only Kid Frost song I’m familiar with, which is the singular reason I bought the album. The Tony G instrumental combines a cool jazz feel with a little Latin flair, and a bass line that still knocks. Arturo’s delivery matches the smooth instrumental as he spits random spanglish lines about a little of this and a little of that, but it’s ultimately a dedication to his people, thus the title, “La Raza” (spanish for the people, or Latin people). This sounds as good today as it did 20 odd years ago. Hold Your Own – Wait, is this the same dude that rapped in the last song? Arturo comes out the gate yelling his lines over a very blah instrumental constructed by The Baker Boys (yep, the ones that lived around the corner from DeWayne and dem) and Tony G. Since the only song I’ve ever heard from him prior to today was “La Raza” I assumed his approach to the microphone would be more Rakim like throughout, but apparently not. I’m not a fan of this aggressive Kid Frost as it exposes his weakness, mainly his lack of breath control. I was so bothered by Arturo’s delivery I don’t even know what the song was about. Straight To The Bank – Another mediocre Tony D and Baker Boyz concocted instrumental with more mediocre rhymes provided by the Frosted One. On a positive note, Arturo does calm his delivery down a bit and the breath control sounds a little better as a result. Regardless, this is very forgettable. Come Together – Ah, the Arturo from “La Raza” returns for this plea for peace amongst fellow-man. The only problem is the Will Rocc instrumental drowns out much of Arturo’s lyrics…and what the hell does the scratched in vocal sample on the hook have to do with the song’s subject matter? That said Will Rocc’s instrumental wasn’t bad, neither was the song. I guess I’m bias to the smoother Kid Frost. Props for not sampling from the Beatles song with the same name. Smoke – I must repeat this statement: I am not a fan of the aggressive Kid Frost. Arturo sounds like he’s trying to hard and come across sloppy. The Tony D/Kid Frost concocted instrumental was decent. Live drums mixed with live piano is always a nice touch. Homicide – You can probably figure out what this is about. Arturo sounds a lot like Tone Loc on this one. That’s all I got folks. Hispanic Causing Panic – Did Arturo just drop the f-bomb? I mean, I know he was a gangsta in his day but I don’t think I heard him drop a single curse word the entire album up to this point. That’s pretty sad that’s the only part of his rhymes that jumped out at me. Needless to say, this album title song was garbage. In The City – Uh…yeah. It’s almost over, folks. La Raza (Cantina Mix) – Other than a few substructions here and a few added bells and whistles there (mainly the extended ending) this plays very much like the original version. That’s a wrap. Folks, there is absolutely no need to dress up Sam Cassell in a dress in an attempt to make him pretty, so I’ll keep this short: Hispanic Causing Panic is a hot mess. 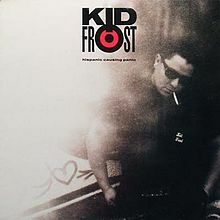 For the majority of the album Kid Frost uses his aggressive delivery, which more often than not leaves him sounding uncomfortable and sloppy. As far as production goes, with the exception of “La Raza” there is definitely a reason why you haven’t heard from Tony D, The Baker Boyz, or Will Rocc after this album. On the bright side, Arturo’s “G” rated lyricism, with the exception of “Hispanic Causing Panic” means I can listen to the album with my kids in the car. I just wouldn’t enjoy it.